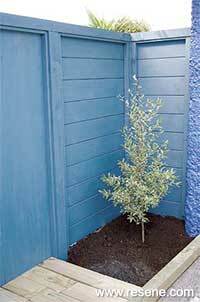 Mark Rayner shows how to increase home security, putting up a stylish blue-stained timber fence and gate between a house and garage walls. You will need: 3 bags of quickset concrete, three 12mm x 125mm dynabolts, 75mm stainless steel screws, 75mm galvanised flat head nails, 150mm galvanised nails, 50mm galvanised nails, stainless steel gate hinges and latch, drill with 12mm masonry bit, a set of drill bits, shovel, screwdriver, saw, hammer, ratchet set, spirit level and paintbrush. 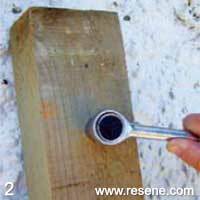 Resene Woodsman Penetrating Oil Stain tinted to Resene Pickled Bluewood. Note: Mark's project was an L-shaped fence with one side measuring 2.4m and the other 80cm. Measurements are specific to this project as a guide only. To get the look: Mark painted the nearby stucco wall with Resene Lumbersider tinted to Resene Cove Grey, then planted Phebalium squameum 'Illumination'‚ in front of the new fence. Dig a hole 60cm deep, hard up against the house. 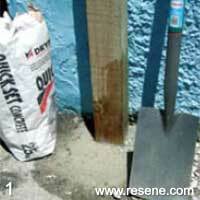 Position one 75mm x 100mm end-post (as shown) and fix into position with a bag of quickset concrete, following manufacturer's instructions. Repeat step one with the other 75mm x 100mm end-post. 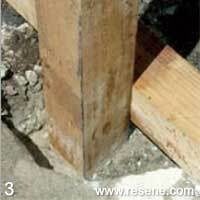 If your walls are solid concrete, as with this garage, use dynabolts to help secure the post. Drill into the concrete with a 12mm masonry bit. Ensure the three dynabolts are countersunk into the post. Tighten with a ratchet. As in step one, concrete the two intermediate (100mm x 100mm) posts into the fence line, allowing clearance for the gate to swing. Ensure all posts are the same height to accept two 75mm x 100mm top rails. So the top rails accept each other at the corner, make a half-joint at each end of the two remaining lengths of 75mm x 100mm timber. Drill pilot holes and nail the rail (150mm nails) to the tops of the posts and the jointed ends at the corner posts. 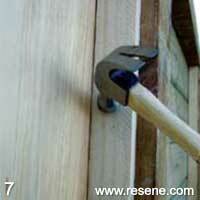 Use 75mm nails to fix battens of 50mm x 50mm timber to the post sides (inset approx 15mm from the front edge). 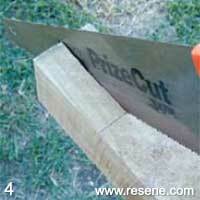 Measure and cut the tongue and groove to fit between the posts. Working from the top down, drill the tongue and groove and screw it to the 50mm x 5omm battens. 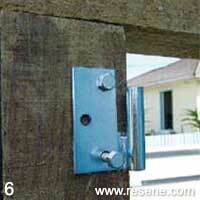 Fix the hinges to the gate and 100mm x 100mm post using the screws supplied (drill appropriate pilot holes first). Similarly, fix the latch to the gate and hang it. Close the gate. 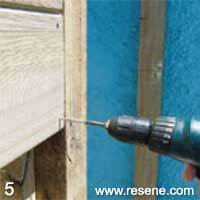 With 50mm nails fix 25mm x 50mm battens to the posts around the gate so it butts up, ensuring a neat finish. Repeat along the top edge of the gate then attach the remaining battens along the upper edge of tongue and groove cladding. 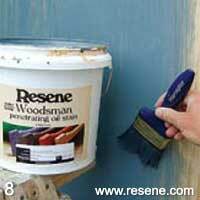 Apply a coat of Resene Pickled Bluewood to all timber surfaces, following the grain of the wood. Allow to dry for 24 hours before applying a second coat.